Solomon Fallas made a mistake. He made a mistake that almost cost him big time. His fully patented product, the 180 Cup, is pretty much a red party cup on one side and a shot-glass on the other. With over two billion red cups used each year in the United States alone, Fallas figured that he can enter the market and perhaps steal a large share of it. He already sold 5 million cups in under six months, which generated $385,000 in revenue. He came in seeking an investment of $300,000 for 15% of his business to help grow the company and fund production. Every pitch in the Shark Tank is naturally unique as each product and entrepreneur are different. But many pitches end up flowing in a similar manner for one reason or another. Whether all the Sharks drop out one after another, or some love the idea and some hate it, it can sometimes seem that the order of events remained the same, and the only thing that changed was the product and the entrepreneur. This pitch, however, was not so typical. Very early in the pitch, before the Sharks even got to delve into the details of the business, Daymond made a take-it-or-leave-it offer of $300,000 for 20%, leaving the Sharks and Fallas speechless and shocked. The Sharks seemed rather annoyed by this offer, as they hadn't even gotten a chance to ask their questions and discuss the business. Fallas was completely taken aback as the percentage was a little higher than what he came in seeking, and he didn't get to hear any other offers. Foolishly, Fallas declined the offer hoping that he would get to hear some better ones, and Daymond went out. But as life in the Tank goes, none of the other Sharks were interested in making a deal, and Fallas was left standing at the cusp of Daymond's mercy. Thinking that he can now accept Daymond's initial offer, Fallas embarrassed himself by saying yes to that deal, even though it was no longer on the table. Daymond ultimately went back in and settled for 25%, which was 10% more than what Fallas originally had planned for. Although the lesson from this pitch was significantly dimmed as a result of Fallas getting a deal, the lesson to be learned is still very stark and very important. For Season 5 of Shark Tank, there were tens of thousands of applicants, each of who dreamed for months for a chance to step foot in front of the Sharks, let alone secure a deal with one of them. The producers worked hard as well to carefully select the entrepreneurs who will get this chance and be featured on national TV. The excitement the entrepreneur feels after getting the congratulatory phone call is indescribable and almost unfathomable. But at the same time, it comes with an assurance that the hard part is still to come. The task at hand becomes crafting a pitch and perfecting a presentation; to do whatever you can do to make sure you walk out of that Tank with a deal. Some are successful, many are not. But the majority of entrepreneurs understand the privilege they have been awarded - to have a chance of partnering with a Shark. This was not the case with Solomon Fallas. The 24 year old founder of 180 Cups was lucky to get a chance. He was lucky to make it through the selection process and to have an opportunity to pitch his product to the panel. But he let it get to his head. Daymond made an offer that was quite reasonable, and he turned it down. He took another chance hoping that his luck would follow him to the end. And after realizing that it didn't; that no other Shark was interested in making a deal, he woke up and let reality sink in a little bit as he gave up an additional 5% than what was originally offered. The lesson is clear: Don't be a greedy pig. Sometimes in life you only get one opportunity. If you pass on that opportunity, chances are you will kick yourself afterwards for not embracing it. 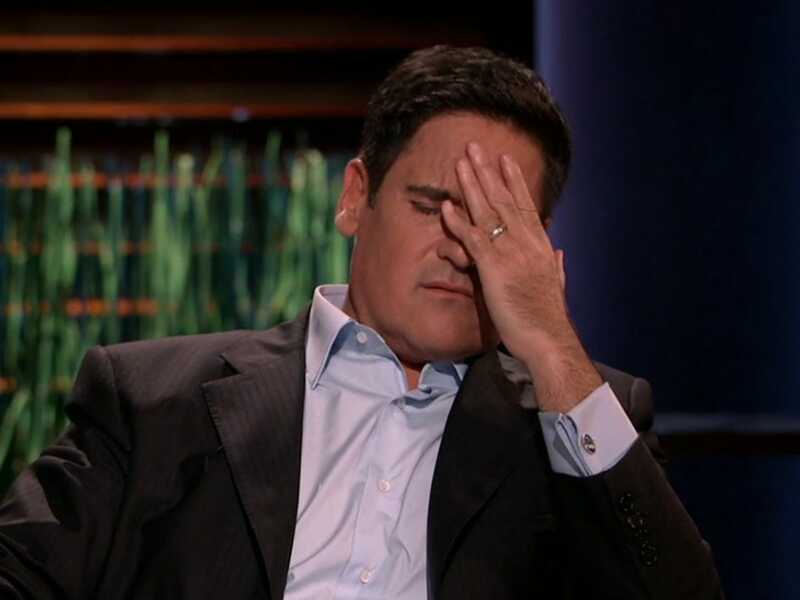 Mark Cuban was dead right: If you saw a $100 bill sitting on the ground in front of you, would you pick it up or run around it looking for more? Stepping in front of the Sharks is a privilege. It's a privilege that a very small percentage of people get. If you are one of those people, don't waste it. Unless you have a very good reason not to, make sure you walk out of that Tank with a deal. Don't gamble in the Tank. Overall Performance: Presentation: 32/50. Strategy: 9/25. Product: 18/25.